Years ago, we would frequent Plaza Damas for different things -- from yoga classes, to groceries, as well as massage and meals. However, things have changed and now Plaza Damas or Hartamas Shopping Centre suddenly feels very -- old and has-been. If not for something urgent that I cannot access anywhere else, I don't think we would go back anymore. The place is old, parking is pricey and many of the stuff you see there are not too "happening" anymore. With the neighborhood Publika and One Mont Kiara which opened not too long ago, it just made going to Damas a bit too far for us. I wonder if it is the same for other people, or perhaps it has its own crowd, those living nearby Plaza Damas. Anyway, this post is about a new discovery. 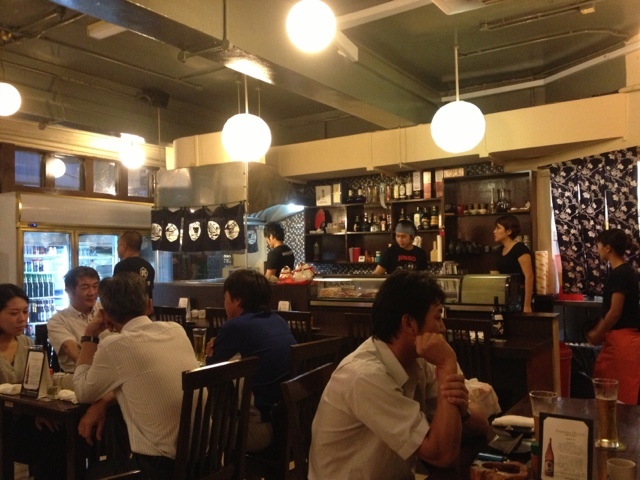 An authentic Japanese place which is small and ran by the owner. Something cozy with good food and service. Something I tried to Google online and read review which I could not easily find. Whenever I did a search on Japanese restaurant Mont Kiara or Japanese Restaurant KL or Japanese Restaurant Hartamas, the usual suspects come up -- and usually the same group of bloggers writing about it. There were hits and misses because of my search for an authentic restaurant, just like the horrific Japanese meal we had at Okomen (see related post HERE). Due to our visit to the Osteopath which is located at Plaza Damas, we had to end up eating dinner there because we were starving. 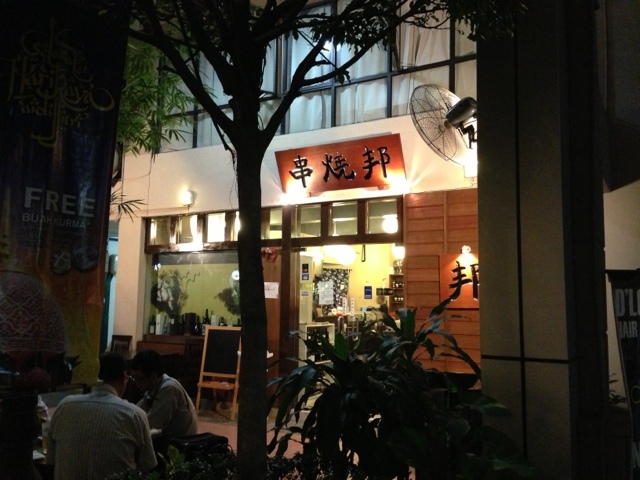 It was Monday night -- and hubby suggested La Yosh, a Japanese fusion place that we went to only once long ago. To our surprise, it was closed. So we walked around to see what's open and to know what's there to eat along that road. We saw many mamak-like places which didn't really appeal to us... then there was the "A Minor Place" at the end of the road however it looked empty so we didn't dare eat there. 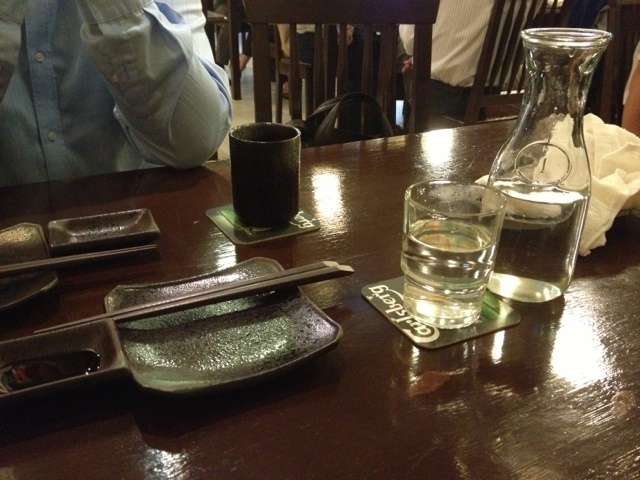 Another old favorite is Rakuzen, however we didn't want to be too boring and eat at the same place. 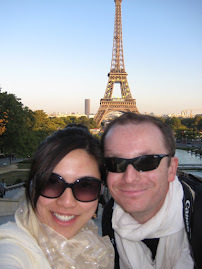 So we walked some more. As we went past Starbucks, we noticed a small Japanese restaurant which is well-lit, and you can see that there were a good number of customers inside. Curious, we walked across the street. Outside, there is no English signage (unless if I missed it), just some Japanese characters written. We saw it was quite busy inside and decided to just try the place. We discovered that all the tables inside were filled with Japanese customers. In fact, all the customers were Japanese, except for us. In the next 10 minutes after we were seated, all the tables were taken and some of the walk-in customers had to sit outside (they have some outdoor seating). I was impressed. Monday night, the place is packed with Japanese people... this must be a good and authentic place then?!? I was lucky because the waiter who attended to us is Filipino. So I was able to ask what this place is about and other stuff like: what's going on, what should I order, etc. 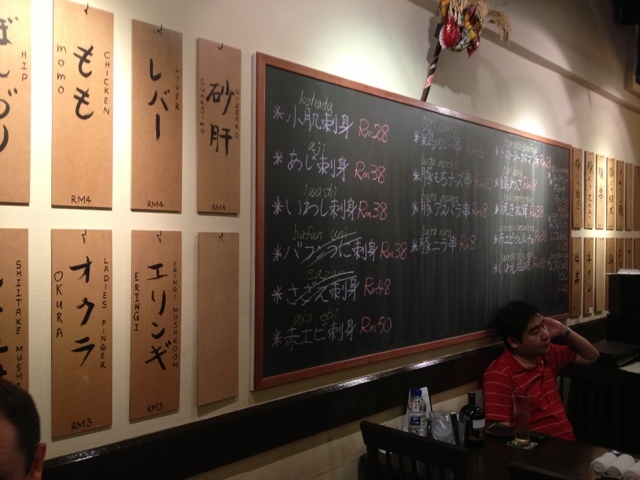 He explained that the Japanese customers usually will come and drink at this place. Along with the drinks, they would order small plates (aka tapas-like plates) with BBQ and stuff, all in small portions. For Pinoys, it's a bit like "pulutan" together with the hard drinks. 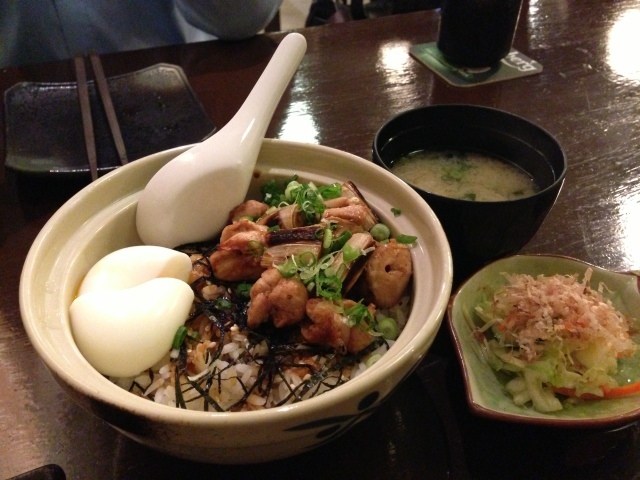 After the drinking, then they would order the main meal -- be it a rice topping or ramen. Of course, the sushi and sashimi are also a highlight at this place, said the waiter. In the middle of the meal, that is when I found out what the name of the restaurant is. I noticed the black shirts that the waiters were wearing, and at the back it bore the Japanese character that was displayed outside. 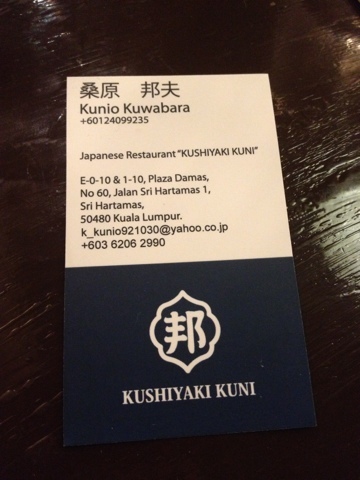 Then there was an English translation which said "Kushiyaki Kuni". Though it was hard to glimpse the name (I didn't bring my glasses at that time), hubby was able to do a search and found one blogger who wrote about the place. 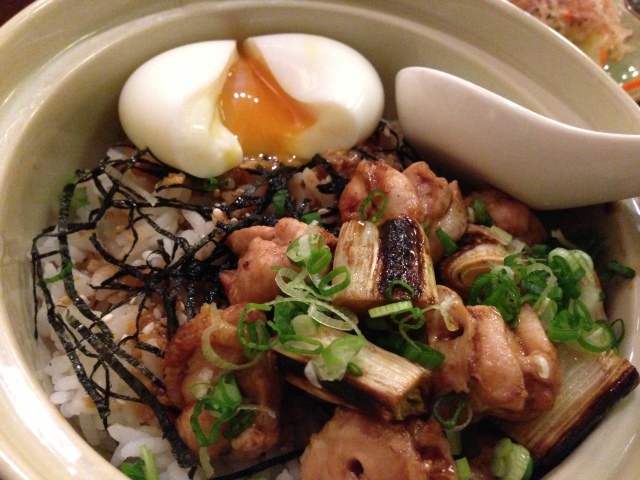 Yaki Tori Don - this is a rice dish with topping of yakitori (grilled chicken with some leeks). It also came with an egg, which was nicely done. Definitely a keeper and will come back for it. Either I was ultra hungry or it was very good. Gindara Teriyaki - small portion but very well done. One of the tastiest and best preparation from a Japanese restaurant so far. Love it. Will surely order again. 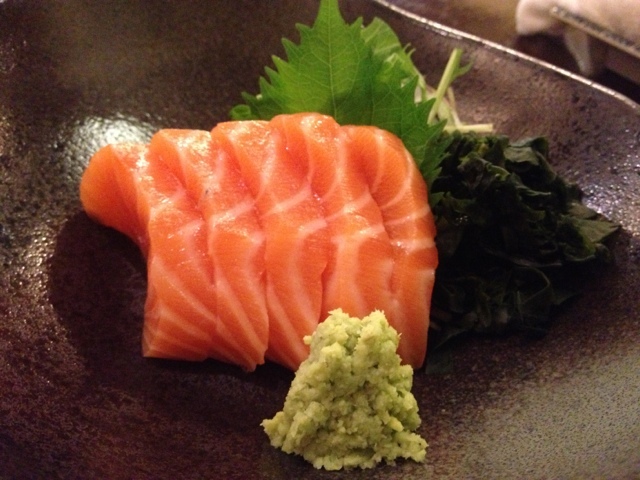 Salmon Sashimi - okay, I am guilty. I stole a piece from hubby and it was delicious! Super soft and melts in your mouth. I had the impression it was better than Rakuzen. I was in sashimi heaven! 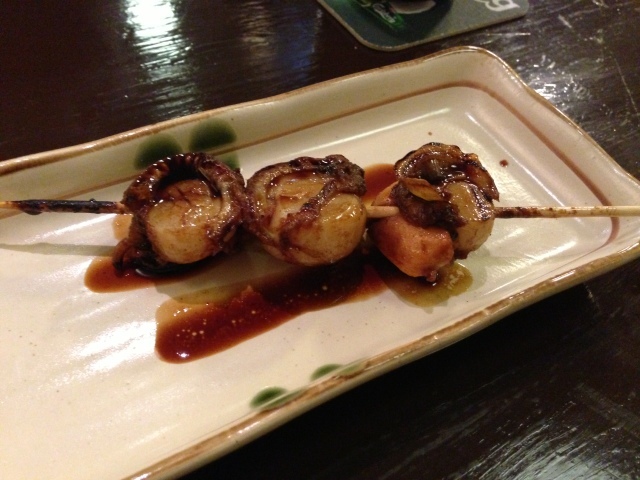 Scallop Kushiyaki - I had high expectations of this bbq scallop which came with 3 pieces. It was just okay for me. So I ate one while hubby had the other 2 pieces. Okay and tasty, however not something I would order again. 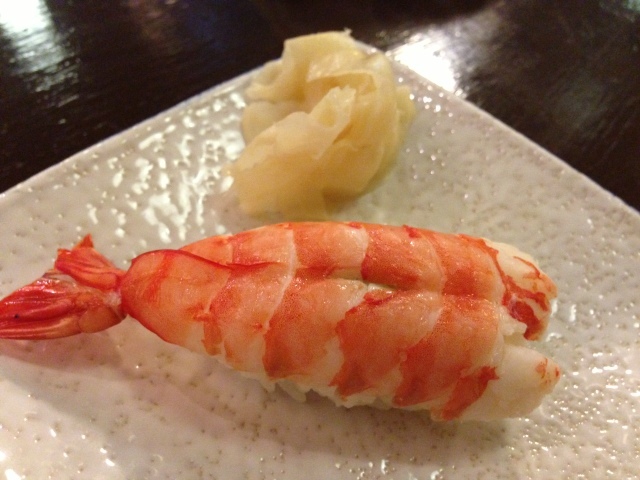 Cooked Prawn Sushi - one big piece of prawn that is partially cooked in hot water (yayy! I can eat this!) which is topped on a nice piece of rice sushi. I liked it and was happy we ordered it. Will we go back? Definitely YES. However, I must warn other people who have small children (like me), I don't think it is a child-friendly place as the Japanese were smoking inside the restaurant. Perhaps if I bring my daughter there, we will sit outside. They do have a small tatami seating room, but not sure what are the conditions of booking that place. Ambience: 9/10 very small and authentic. Reminds us of Japan and the small restaurants they have there. Plus for a place filled with Japanese folks, it really makes up the ambience! Food Quality: 9/10 it is as authentic as it can get. The chef is Japanese, the owner is Japanese and is present at the restaurant making sure everything is running okay and well. Definitely one of those places I have been looking for in terms of authenticity and uniqueness (sans the very commercial atmosphere of Rakuzen and the other restaurants from the same group : e.g. Hokkaido, Sushi Zanmai, etc). Service: 9/10: very attentive waiters. They pour the drinks and ensure no table is left unattended. The true Japanese way of service... unlike what we get from Rakuzen and other establishments of the same group. 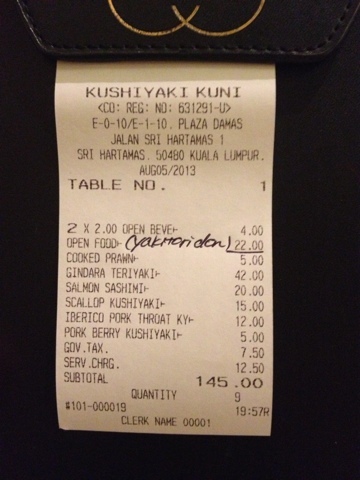 We do like the food at Rakuzen but their service usually not good (that's already putting it lightly). Here, you feel like a real guest in their restaurant. Salmon Sashimi that was very satisfying! 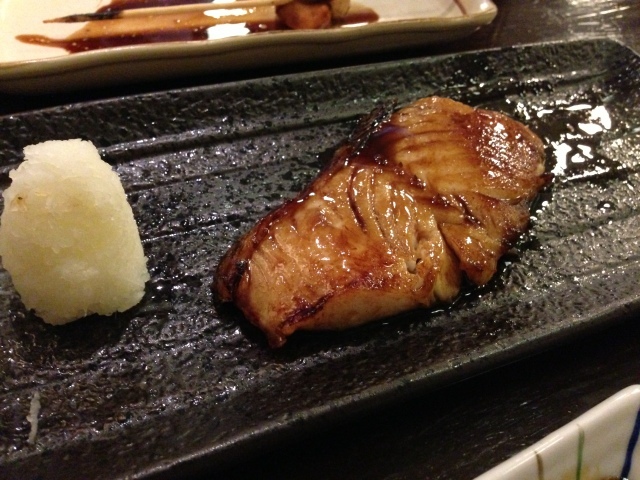 Gindara Teriyaki - superbly done and will surely be back for this! Cooked Prawn Sushi - tasty and nice... happy they have this! Iberico Pork (the darker meat) and the Pork Belly -- killer pork bbq stuff from the place. Must try these two! 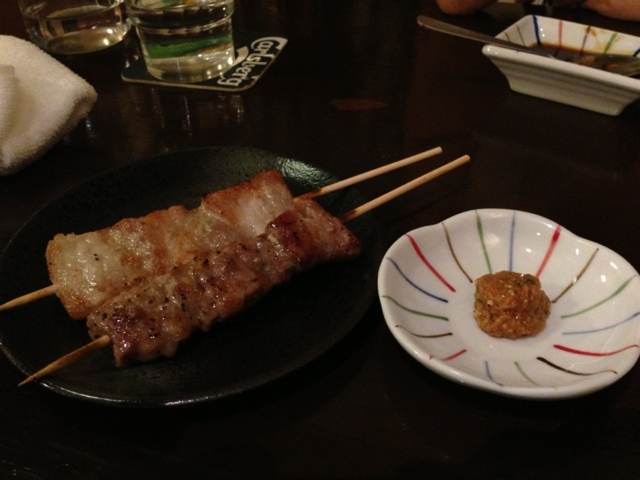 It comes with the sauce on the side, which pairs perfectly with the kushiyaki's! Exterior of the restaurant. This is what you will see if you are walking along the street (near Starbucks). This is across Starbucks and that bagel place.